KYBELLA treats submental fullness (double chin), which can be caused by aging, genetics, and weight gain in both men and women. The KYBELLA injections contour the shape of your lower face by reducing fat. 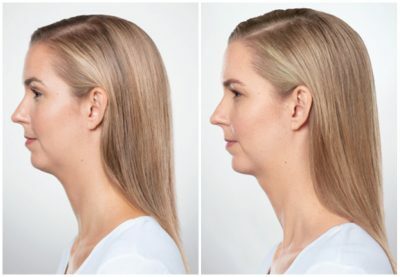 This results in a more defined chin and jawline. During each treatment, you will receive multiple small injections under your chin. The injection process takes about 15 to 20 minutes. The exact number of injections will depend on the amount of fat you have under your chin and your desired profile. There is no downtime with KYBELLA injections. Immediately after the injections, there will be mild redness, discomfort, and inflammation to the injection sites. This area will feel tender and swollen for a few days. In some individuals, this swelling may last for a few weeks. It takes time for your body to clear the dead fat cells. You should expect to notice the results after 1 month and optimal results after 3 months. It may take a few sessions of to reach your desired results. Please keep in mind that each patient is unique and your results may vary.